A priest is available to hear confessions on Tuesdays, Wednesdays and Thursdays at 12.15. Alternatively, confessions may be heard by appointment with any of the clergy. The clergy are pleased to prepare and instruct those seeking the sacraments of baptism and confirmation. Joseph Miller was recently baptised in Chapel by the Principal in the presence of a large congregation of Puseyites past and present. The Bishop of Ebbsfleet, who married Joseph’s parents Charles and Kate, preached the sermon. The House seeks to foster and support vocations to the priesthood. 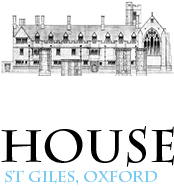 Among recent members of the Pusey House community to have been ordained are Charles Miller who was made Deacon and Daniel Smith and Matthew Bemand who were ordained priests in 2007. Philip Corbett, a former Sacristan has been studying at the College of the Resurrection, Mirfield since 2006, and was joined there in 2007 by Ian McCormack, a former server and Secretary of the Friends. Harri Williams, Sacristan in 2006-2007 began his priestly training at S. Michael's College, Llandaff in 2007, while Daniel Lloyd and Richard Doney began their training at S. Stephen's House, Oxford. Present members of the community are in varying stages of discernment. The Principal is a vocations advisor in the diocese of Oxford and is a Selector at conferences. He is always willing to speak to those considering a vocation to any aspect of ministry.